Inspired by the global eBird 2017 checklist-a-day challenge, we thought it would be fun to run a small, informal and purely friendly Last Birder Standing contest. Very simply, starting 1 Jan 2017, create at least one ‘complete’ birdlist every day, for as many days as you can manage. More details below. The challenge: look for birds every day, from 1 Jan 2017. Do this for an unbroken stretch of as many days as you can. The immediate target is to have at least one birdlist for all 365 days of 2017. But we’ll continue the contest unto 2018 and longer (if needed) until only one birder remains standing (ie, has maintained an unbroken daily run of birding). We suspect that despite our best intentions, the main reason to skip a day’s birding (the minimum is only 3 min after all!) will be because we forgot. So the Last Birder Standing will likely be the person who has an effective reminder system — perhaps an daily alarm on your phone, or an automated daily email, or (perhaps most effective) a note written on your mirror! To make it more fun, we ask that you register your name for this contest by dropping a line in the comments section below. Please note that it may take a little while for your comment to be approved and thus show up on the page. 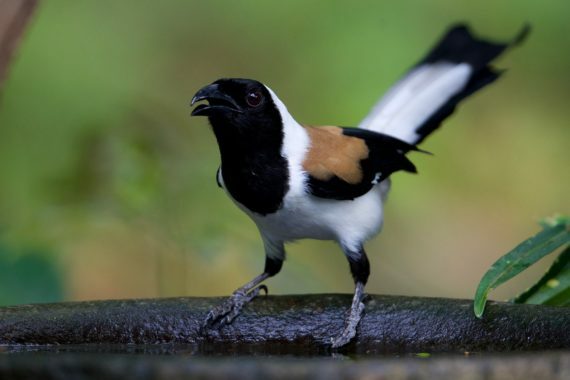 Take the daily birding pledge today! Who has taken the daily birding pledge? We have created a Facebook group for general encouragement and discussion about Last Birder Standing. If you name is listed below and you aren’t yet part of the group, please drop us a line. We realize that not everyone is on Facebook, and our apologies to those below who aren’t, but this was simply the most convenient platform we could think of..
By coincidence, an article has just been published (31 Dec) on the American Birding Association blog, by Ted Floyd, who has completed 10 full years of daily birding! I suspect my daily bird logging, more than anything else, kept me going. It kept me focused; it kept me disciplined; it prevented me from getting distracted. Anyhow, I was hooked. There was to be no turning back. In the decades ahead, I would keep on birding, keep on learning about bird biology and identification. Count me in. Sounds fun! I’m going to try my best, setting multiple daily reminders, as I’m sure forgetfulness will be my downfall..
At last…You done it.HaHaHa….I am definitely take part Now.Above photographs also define this challenge.Every birder see behind who remain last?Now it’s time to inspire Global eBird….मान गये भाई!!! but terrified of what it would do to “my checklists” page. You’re right that the “my checklists” page is very hard to navigate. We are working on an app (separate from eBird) where you can upload your eBird downloaded data and explore in more ways that currently available. I will try my best.. I am in. What if the list is from outside India? Doesn’t matter where the birdlist is from. Main thing is to bird every day! Would you consider spreading the word on social media? Celebrity endorsement would work wonders! Am in too…the last man’s battle is going to be interesting. I am in but I will try my best to win. I am in . 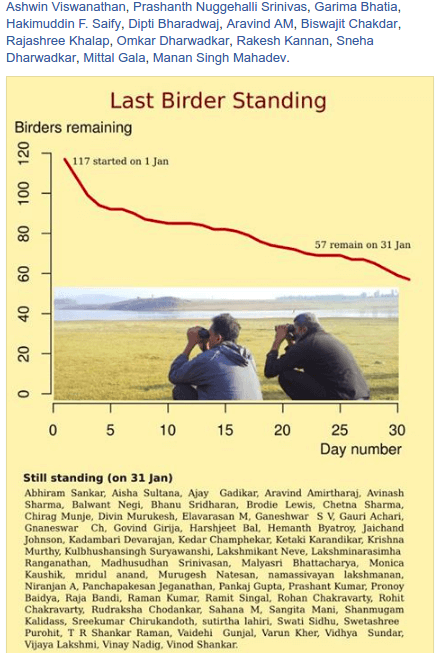 Would be fun if birdcount india releases the remaining people’s list weekly as time progresses . Should this be just 3 mins list? It can be even 15 mins lists right? I will not try, I will do it & I will win it. I am in. Will try to do it. Gonna be my new year’s resolution. Let’s start Birding. thank you inviting me in fb group.. I would like to be part.. Sounds worth a try. Count me in. Sounds really hard but I shall try too. As long as it is lists from anywhere (just saw Kullu’s comment and your reply). This is one interesting challenge. I am surely down for this one. Procrastination, you old enemy! 2017 is when I vanquish you. Birdcount.in daily challenge, I hereby solemnly take an oath to try my best to be the last man standing in this task. I am in. Thanks for initiative.. I am happy to bird anyways. Am in. Will give it a good try! I am for it. I will try my best to stand last. Even for hard days, it will be a birding day. My new year resolution. Ah, this should be fun. Hoping to do more regular ‘ebirding’ in 2017, count me in too! Nice idea.. I give it a try.. I am in! Cheers to the birds and the birders all around. By the way, I hope the challenge is not limited to Indian region only? Something new always begins with something small. I’d like to give it a try! Kindly add me , will try my best . I’m in… Hoping against hope that I do this! My name’s on the list, but I ‘ain’t on no Facebook’. Is there some way to view the action on the Facebook group? Can you make it public, for instance? The group’s settings are ‘public’, but unfortunately it looks like it’s only ‘public within Facebook’. If anyone knows of a way to get the group to display for those not logged into Facebook, please let us know. Sounds fun. I am in for it. I love this… I will try to stand as long as possible…. hope some interesting results! Lots and lots of observations will be added this year. Super fun. Yes – join all of us in this fun game. Joining…hope to last for weeks, if not days!! I hope I can still participate. Please count me in! Hope I can participate. Count me in. Yes certainly. Hope you got some birding done yesterday! I am in , please count me ! have already submitted 2 checklist . Great! Hope you did some birding yesterday. Please count me in. I did birding yesterday and today and will submit the checklist to eBird. Thank you. Bird watching rubs off on you inevitably when you are surrounded by so many crazy and enthu birders… so count me in! Ok let’s give it a shot ! Keeping Calm and Birding on.. Challenge accepted..
sometimes 3 mins turns up a zero bird list –does that qualify ? Yes, that qualifies. But do try to bird for longer if you can! I’ve been doing this, but didn’t realize there was an informal registration. Count me in! One question, since you mentioned a reminder system: I have checklists for every day, but some were entered the next day… Are those weeded out? Excellent and welcome! No problem if your lists are entered later. The reminder is to go birding; list upload need not be on the same day. Is it possible to share the current list of birders who have made it so far here? I’m not on Facebook, and since the group is not public, I’m unable to view it – and there may be a handful of others in a similar position. I hope it’s not a hassle. Here’s a screenshot of those left standing as of 5 Feb. There may be others too — we will have left out anyone who hadn’t uploaded their January lists by then. So this is a *minimum* list. Please click on the link below. After the GBBC madness dies down, we’ll think of a way to post updates on this page as well. Any updates on the folks left standing in (February and) March 2017, or so far? Will update in early July. The problem with doing this more regularly is that it isn’t straightforward for us to include (a) zero-species lists and (b) lists from outside India. This means that our list of Birders Standing is incomplete.. Will try and include (a) and (b) above at the end of June! Do you have any updates on the current birders standing? Thanks for this. Have you been birding every day since 1 Jan. The start date for this was 1 Jan. Do let us know. Thanks! My name is missing why? Is it possible that you hadn’t uploaded all your Jan checklists by 1 Jan? Or do you have any zero-species checklists? If you have been birding every day since 1 Jan, please don’t worry; you are still standing! As mentioned, this is just a minimum list. I am in. Wasn’t regular until April. In between some days will get skipped.